Note: this page was written in 2008. In 2009, the SELENE spacecraft was purposely crashed into the moon. I keep this page up because the antenna can be used for other 2.4GHz projects. The more interesting part is that in spite of very modest power, it is possible to receive some of the spacecraft signals with simple equipment. 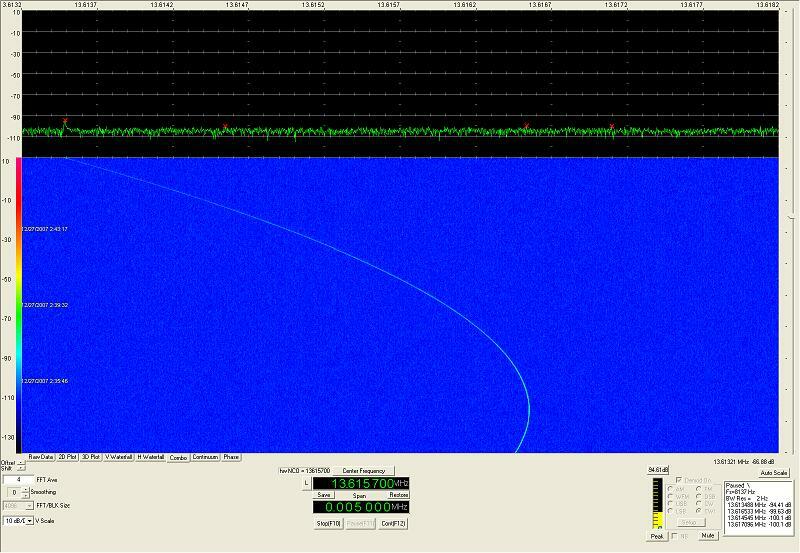 The easiest signal to receive from the orbiter is a beacon at 2263.602 MHz +/- doppler, which can be as high as +/- 22 kHz. A number of people in the Microwave Mailing List (Ref 2) have reported hearing the beacon quite clearly with modest systems, so I wanted to try too. The antenna is usually the most important part of any receiving station. If you cannot capture the signal, there is little that electronics can do to bring it out, even though modern digital signal processing techniques are quite miraculous. While the signal appears quite strong (by comparison to other signals that might come from outside the earth's immediate vicinity), it has travelled 384,403 km (about 240,000 miles) so it would be best to make sure we don't loose a few dBs too many. I could have built a helix antenna with the right polarization, which would have been the perfect match for the signals sent by the probe, but I wanted to use a DBS dish I had in the garage. It was discarded by my neighbors after an upgrade. 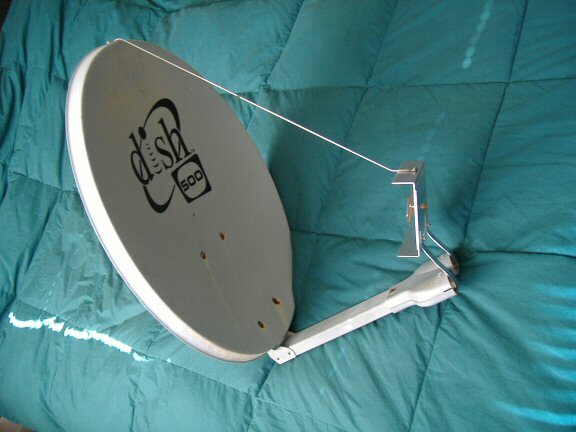 So I built a simple feed to drive the dish. 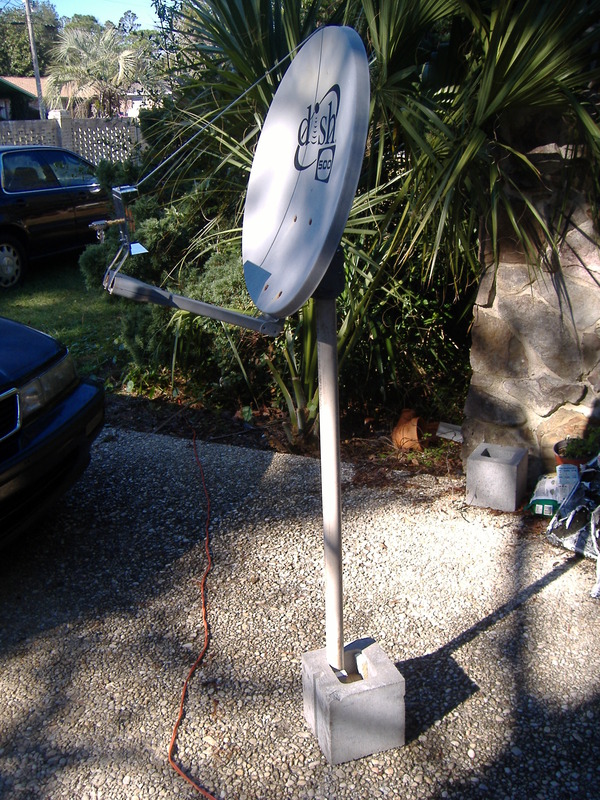 The dish is offset fed, 22" tall and 20.5 wide, it came from a dual LNB DISH Network system. The gain of the dish should more than offset the loss due to non-optimal polarization. A simple feed design for 2.4 GHz is the bi-quad. There are many descriptions on the Internet because they are used to extend the range of 802.11b/g Wifi networks. If you Google "WiFi biquad antenna" or "Wifi bow-tie antenna", you will find lots of links to examples of construction. I found a few that I liked and made my own using what I had on hand (Ref 3). The bi-quad radiator is supported by a short piece of .141 semi-rigid cable that was already attached to a bulkhead SMA connector, ideal to plug right into a DBM. I have a few right angle pieces of aluminum sheet ~0.045" (a tad too wide, but nobody has complained...), two made a handy reflector. 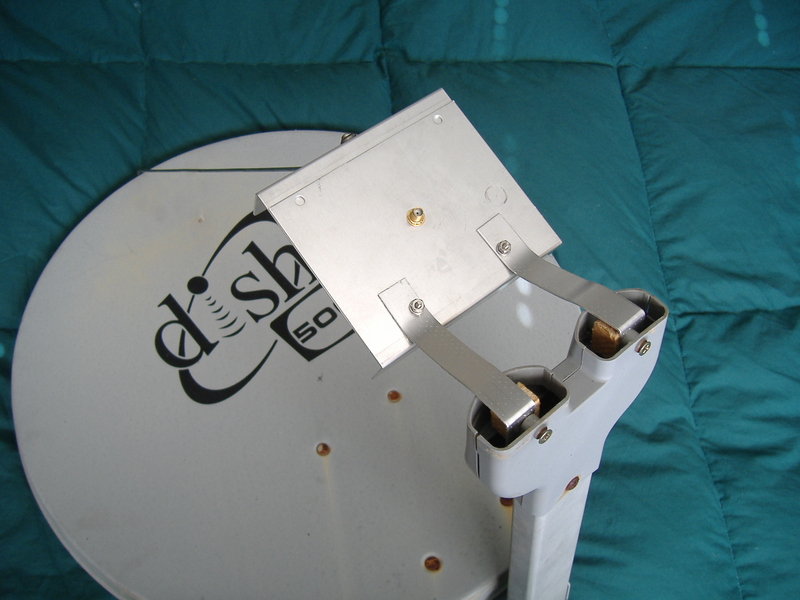 A piece of heavy coat hanger wire ties the reflector to the dish and stiffens it. Some people might call it flimsy, I prefer to call it "dynamically adjustable". I located the feed (axially) by eyeballing the approximate target point of the original feed on the dish. I then made a pencil mark on the dish and measured the distance between that point and the apperture of the original feed. When I installed my feed, I bent the supports until the bi-quad was approximately in the same location (within about 1/2 inch). The picture below shows the new feed installed on the antenna, and behind is the old Ku band feed for comparison. 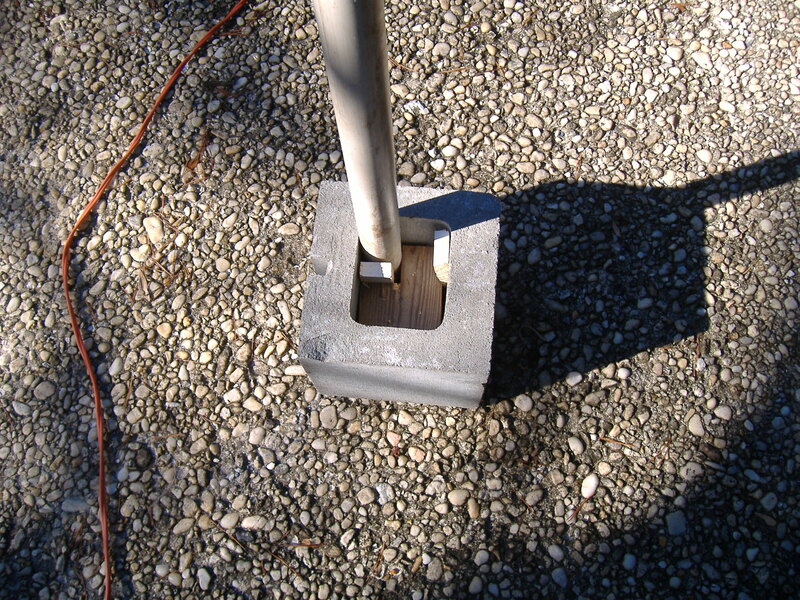 I made a stand with PVC pipe and a cement block (see pictures). That will work for a temporary operation. The PVC tube is held in place with a wood block appropriately cut and two wood shims. The mixer's LO port is driven from a microwave signal generator HP 8672A. 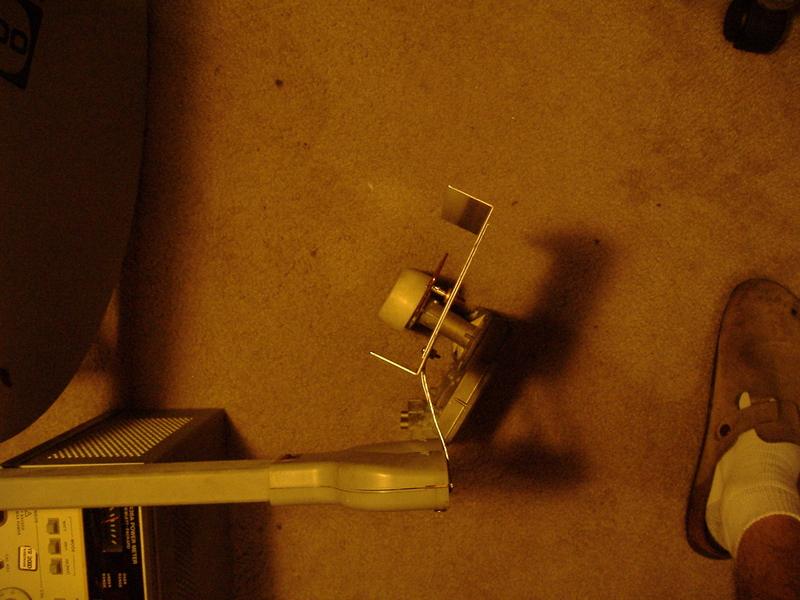 This is not the way you would want to go about building a satellite receiver, but it was available and I was in a hurry. The FT-817 can be used either to listen to signals directly through the speaker, or can drive the audio input of a laptop running Spectran (Ref 4) for display. This receiver could be considerably improved by using a real low noise amplifier and an image filter. A noise figure of less than 0.6 dB can be achieved in this band with P-HEMT transistors, check HP AN1129 application note (Ref 5). As long as an LNA is used in front of the mixer, an image filter should be installed between the LNA and the mixer. This will provide 3dB improvement of the signal-to-noise ratio, regardless of the noise figure of the LNA. I am planning to build a pipe cap filter for that (Ref 6). I have written a page about checking the Noise Figure of the LNA (Ref 7). When selecting a LO frequency, make sure to avoid getting the 802.11 stuff at 2.4 GHz in the image. I use low side injection and a low IF (28-30MHz or less) so that I can run a fairly long coax cable (~25') from the IF output of the mixer back to the shack where the IF radio and the rest of the equipment is, without having too much loss. Normally, a low IF should be avoided because it makes the image reject filter harder to design and build. However, as you can see from the plot above, an inexpensive pipe cap filter will easily provide about 19 dB of attenuation at 30 MHz and 30 dB at 100 MHz below the receive frequency, so IF frequencies as low as 30 MHz would be usable. With a 30 MHz IF, the image frequency would be at 60 MHz from the receive frequency, where the filter has about 25 dB of attenuation. Michael Fletcher, in Finland, has reported receiving SELENE with as little as a paper click (extended!) 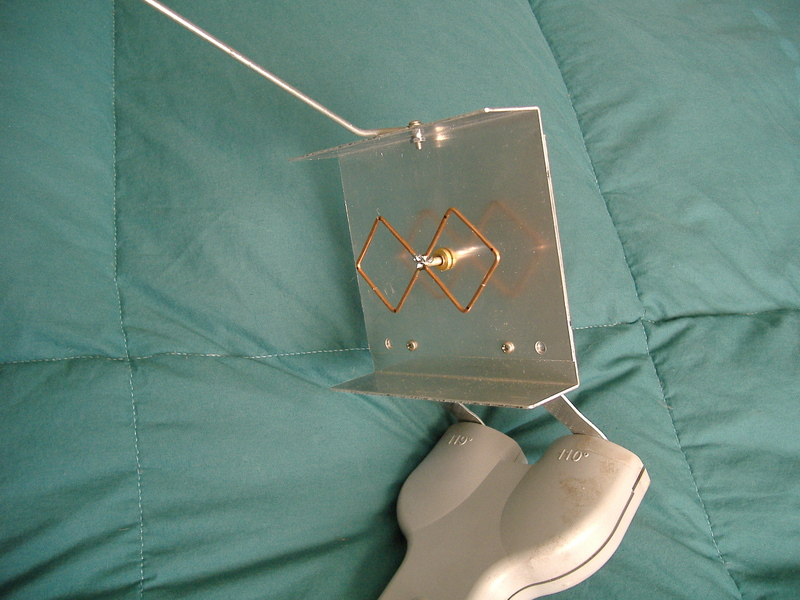 as an antenna (Ref 8). YMMV.